Dare I say it but there was actually a bit of warmth in the air this morning, yesterday’s brisk wind nullified and after some early morning cloud plenty of sunshine too. In response it seemed that the stuttering spring migration of the past few days was finally beginning to gather momentum with at least four male Wheatears spotted around the coast and a pair of pristine White Wagtails at Croig, our first of the year. Nothing too dramatic but progress nevertheless. 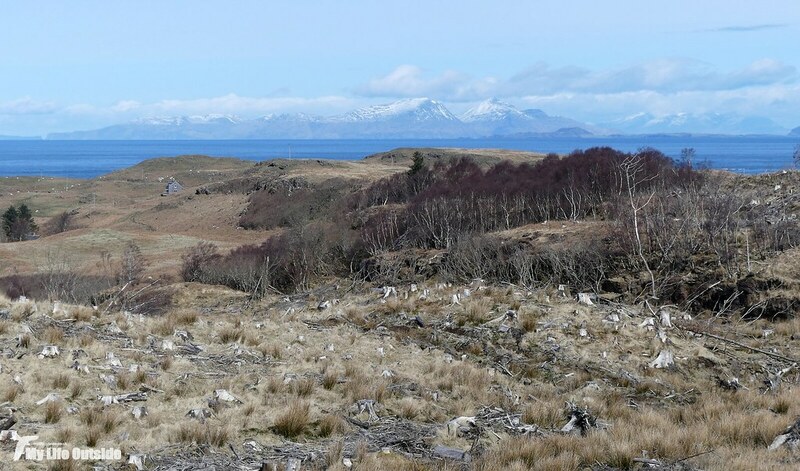 As we set out for Langamull there was still a dusting of snow visible on the highest peaks but here along the coast the landscape had returned to a patchwork of bleached yellows and greens. This made for a somewhat bleak walk down through the deforested valley above Langamull itself where Wrens dominated in the absence of much else. Ahead though was a view like no other, snow covered islands stretching across the horizon for as far as the eye could see. 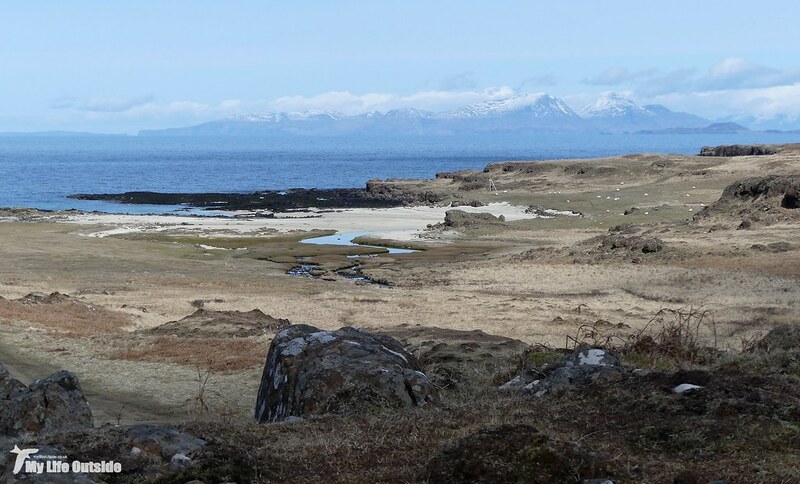 Up front the squat shape of Canna, Rum and its jagged peaks next door with Skye looming large behind. Further back the Outer Hebrides were clearer than we could ever remember them, distant lands which we desperately want to explore. The white sands and blue green waters here look like they belong in the Caribbean more than Scotland and now the secret's out days when we had the place to ourselves are long gone. Even so there’s plenty of room to go around and having found some suitable rocks from which to watch the sea we settled down and did just that. Immediately it became apparent that this was going to be a good diver day. Off to our right a Red-throated Diver was just emerging from one of the many small inlets whilst out in deeper waters Great Northern Divers were gathered in ones or twos pretty much wherever you looked. Closer in a trio of Razorbills were nice to see with the usual assortment of Shags passing through and, unusually, three Cormorants perched nearby. It’s still too early for any Shearwater action up here but a couple of Eiders swam through heading west. 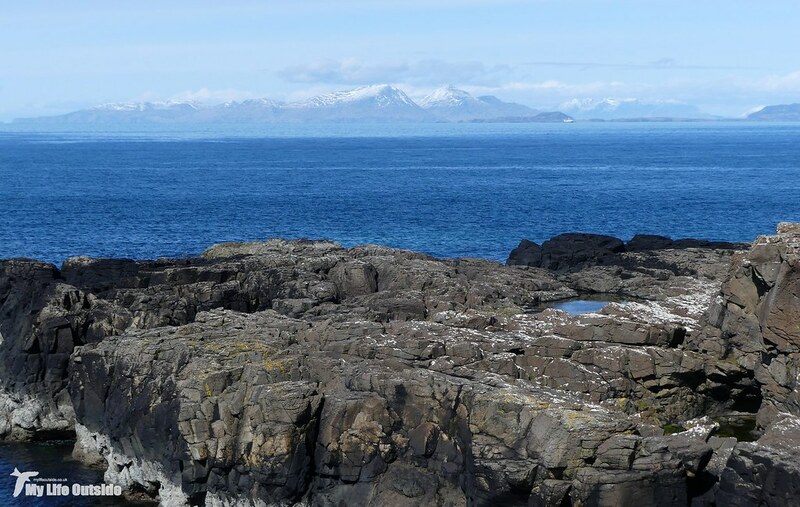 Following the coastline to Port na Ba delivered a Gannet sat out on the sea whilst a White-tailed Sea Eagle was soaring way off in the distance. 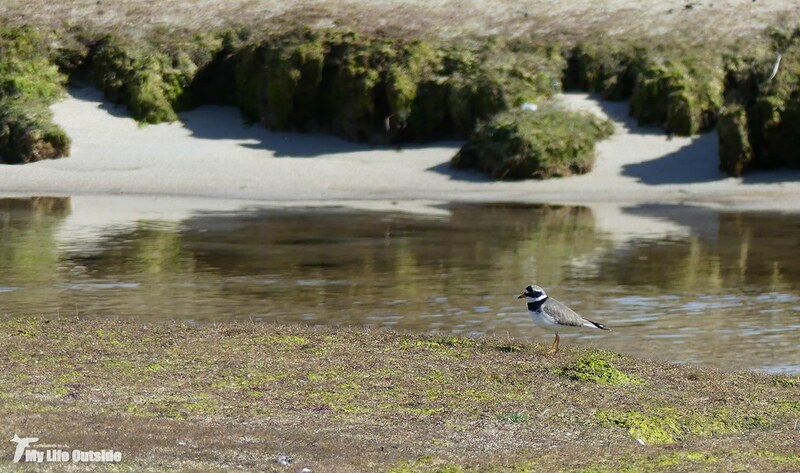 I managed to put up a Common Snipe, as usual before having spotted it, but had more luck with this Ringed Plover, one of a pair nearby. 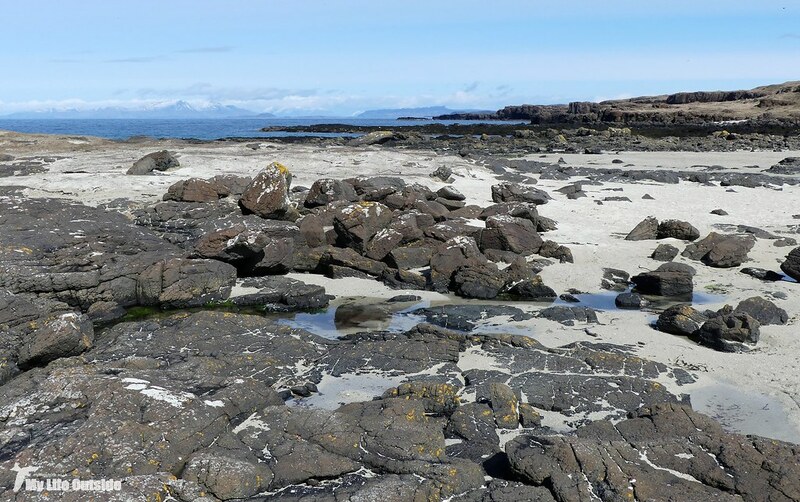 At Croig itself there was an impressive count of sixty nine Common Seals hauled out on the rocks and there would likely have been even more had a couple of other visitors not walked right up to the edge in brightly coloured clothing and scared a large number into the water. Not wanting to add to any unease I instead unsuccessfully turned my attention to a lovely male Wheatear which ultimately emerged victorious. No change there. Feeding on the exposed mud were a decent selection of waders including Curlew and Redshank but by now I was definitely starting to feel the efforts of two weeks solid walking and decided that it was time to call it a day. Or we would have done had it not been for the small matter of the trail-cam which we’d put out a few days earlier. With heavy rain forecast for tomorrow this was our last opportunity to collect it before the end of the holiday so on aching legs it was back along the coast to where hopefully our chosen sheep had been providing ample sustenance to a whole host of creatures. It does however pay to step carefully when off-piste around here as Emma almost found out to her cost. 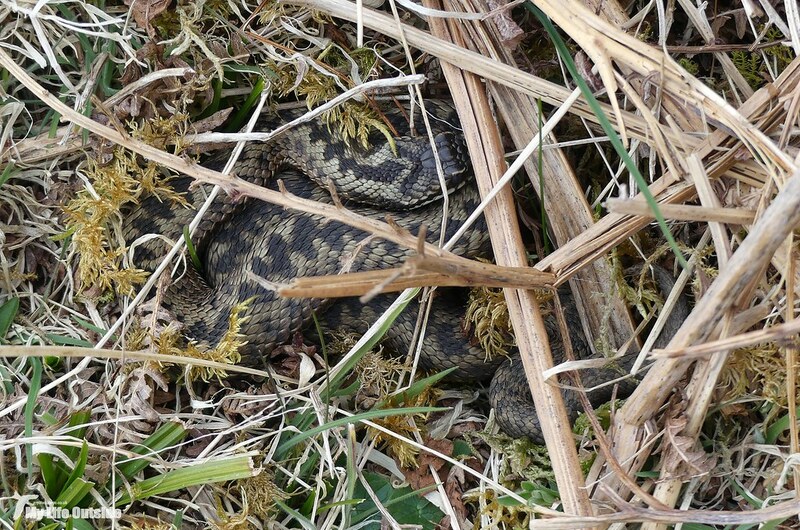 Just a few inches to one side and this dozing Adder would have had a nasty shock. Even from a distance we could tell that there had indeed been activity on the sheep carcass. For one it stank, the smell of rotting meat a reminder that next time we attempt this we’ll approach from downwind. Then there was the mass of wool which had been scattered nearby and once we were finally close enough the sight of ribs protruding from what just a few days earlier had been a complete animal. I’ll spare you the gory details dear reader but suffice to say it was not pretty but did mean that we should have captured at least something on the camera. We had an anxious walk back to the house before we could check our footage and you know what? It was more than I could ever have hoped for. This is just a raw still from the very first video clip we opened and I think you can probably tell why I was so excited. 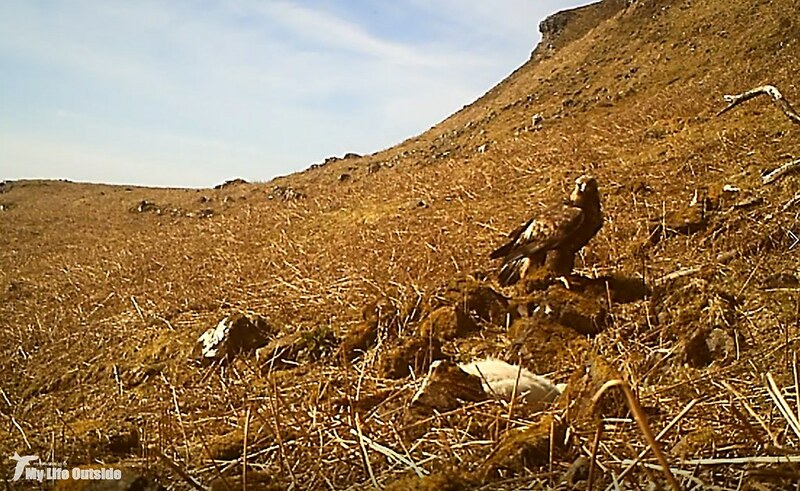 A Golden Eagle on prey was exactly what we were aiming for and to get it on our first attempt is quite remarkable. In all I’ve got over two hours of footage to sort through, edit and publish and that should all be coming your way very soon. Trust me, it will be more than worth the wait.